To ask precisely where and what encompasses the Asia-Pacific is a central question of political geography. The vocabulary of the discipline is conditioned by the interaction of historical framings of global space, but its terminology also reflects the contemporary world: its geopolitics, levels of regional economic integration and cultural affinities. They are terms that allow for a variety of framings (or spatialities) which overlap and change over time as scholars respond to shifting dynamics. With the launch of the Asia Dialogue, this short piece explores how historical attempts to respond to ‘Pacific’ problems were central in the emergence of Asia-Pacific studies. To elucidate this point, I briefly sketch the impact of the summitry, research and personnel connected to an influential yet historically marginalised organisation, the Institute of Pacific Relations, 1925-1960 (IPR) – a distinct, formative attempt to consider and collaborate on regional issues. Looking at nomenclature alone, focus upon the ‘Pacific’ seems to be drifting from studies of the ‘Asia-Pacific’. Whatever the future holds for our scholarly enquiries however, we should be aware of our area studies’ ‘Pacific’ precedent. We often hear talk of coming ‘Asian’ or ‘Pacific Centuries’, but our predecessors have long framed global futures in this regard. By the final decade of the nineteenth century, it had become the consensus – and by the 1930s – “a platitude” (as Charles Hartley Grattan called it) to describe the ‘Pacific’ as the global space in which the political and economic gravity of the world was shifting. The Japanese intellectual, Inagaki Manjirō had conceived of a coming ‘Pacific Age’ by 1890. Hubert Bancroft, a leading voice within an emerging ‘California School’ of American history conceived of the ‘New Pacific’ in 1900, describing the purportedly ‘new’ geopolitical reality America found herself in following victory in the Spanish-American War of 1898. For Bancroft, this was clinching evidence of increasing American influence in its regional politics. In this first ‘New Pacific’, Japanese victory in the Russo-Japanese War in 1905, the opening of the Panama Canal in 1914 and the conferrance of Mandates upon Japan, Australia and New Zealand after the First World War served only to cement visions of this direction of travel in global politics. In an age of ‘Pan-Ideen’ (with Pan-Asianism proving perhaps the most well-known), Pan-Pacific ideas also emerged and were critical both to the emergence and staying power of a series of international initiatives, such as the IPR. The ‘Pacific’ that Manjirō and Bancroft were describing was broadly conceived and could elude to a space which included the West coasts of North and South America, East Asia, Southeast Asia, Australasia, Oceania and Antarctica. Part of the potential of the ‘Pacific’ lay partly in the elasticity of the idea and its framings. This was an oceanic regionalism, but its bounds could be stretched further, extending to Central Asia and the Indian Subcontinent to account for Russian interests and for Indian diasporic interests which stretched to Fiji and Vancouver. Where they used the catch-all term ‘Pacific’, we might now use Asia-Pacific. Trans-Pacific dynamics – particularly relationships between North America and East Asia were central, yet it was precisely the broad definition which imbued the ‘Pacific’ with such political and economic potential that so many became keenly intellectually involved with the obstacles and opportunities its study presented. Despite the broad conception however, thinkers perceived a coherence to the space. In part, this was an oceanic imagination with the Pacific a frontier where ‘East’ and ‘West’ met. At large, they perceived a commonality in the problems the region had to tackle. On the morning of the 30th July 1925, one hundred and forty men and women – missionaries, business leaders and intellectuals – representing nine countries which border the Pacific Ocean including China, Japan and Australia descended upon the Pauahi Hall at Oahu College in Honolulu. Many did so with a degree of scepticism and uncertainty, partaking in an international experiment: a two-week programme of round tables and addresses, designed to stimulate discussion concerning what were collectively described as ‘Problems of the Pacific’. Discussions were to be ‘unofficial’, representing individual, rather than governmental opinion – what we might now call track three diplomacy, with reports only published following proceedings. Individuals were encouraged to speak frankly and independently about agreed subjects: race relations, industrialization and regional diplomacy among others, so as to consider ways in which the “mutual relations” of the peoples of the Pacific might be improved at a symbolic crossroads between ‘East’ and ‘West’. From an experiment in international relations, the Institute of Pacific Relations was born. A curious fusion of trans-Pacific missiology, local business interests in Hawaii and a globally resonant pacifist internationalism were some of the stimuli that encouraged the founding of the IPR which “practically stood alone” between the 1920s and 1950s as an organisation dedicated to questions pertinent to the Asia-Pacific region (according to John K. Fairbank). It attracted significant philanthropy from Rockefeller and Carnegie funds which supported its research agenda. Before the IPR’s demise, over one thousand publications by guest authors and members of the Institute were published. Landmark studies of the time, such as E. Herbert Norman’s Japan’s Emergence as a Modern State and G.E. Hubbard’s Eastern Industrialization and its Effect Upon the West were published under its auspices. The IPR thus became the single most important resource for information and the latest research regarding the Asia-Pacific region published in the English language. 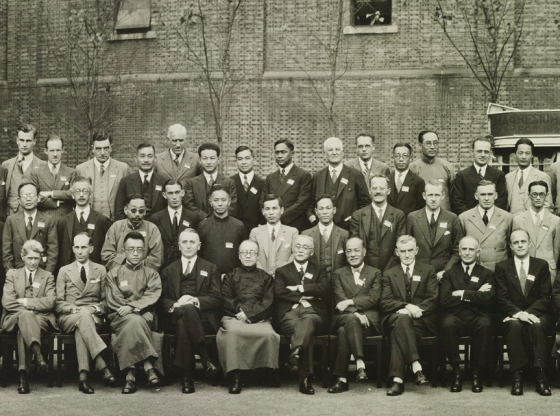 Over thirteen conferences held at locations as diverse as Kyoto (1929) and Lahore (1958) were held, where minds met and thinking shared, leaving a lasting impression upon delegates. This impact still resonates today. We continue to read the pages of the IPR’s flagship journal, Pacific Affairs, whilst numerous area studies departments sprung from the impetus and impact of its leading members. In the United Kingdom, the University of Leeds’ Department of Chinese Studies’ first professor was Owen Lattimore (a former editor of Pacific Affairs). The founding of the ANU College of Asia & the Pacific meanwhile owes a debt to the influence of Frederic Eggleston, a leading member of the Australian Group. Many regional organisations also drew influence from the IPR’s constitution, research and conference method. The East-West Center’s constitution reads similarly to the IPR’s for example, whilst the Pacific Basin Economic Council, founded in 1967 was founded explicitly to fill the void the IPR was thought to have left upon is demise. In India and Pakistan– particularly from the 1940s onwards – engagement by emerging members of the foreign policy establishment with the IPR have left an important legacy. The Council of World Affairs and Gokhale Institute of Politics and Economics were closely affiliated to the IPR. In 1950 and 1958 respectively, IPR conferences were held in Lucknow and Lahore. In an age where India and Pakistan were articulating independent policy positions, the IPR proved a key source of information and organisation from which to formulate and to articulate these positions. In the end, the IPR’s good-will, well-meaning and semi-official status proved key factors in its downfall. “Content to play lily in a barnyard” as Herbert Croly of the New Republic proclaimed, the IPR could not prevent the great conflict in the Pacific which it originally foresaw. The ‘Problems of the Pacific’ were perhaps too great. The charge of Communist sedition (for close association with Chinese counterparts) against a number of its leading American members – Edward Carter and Frederick V Field perhaps above all – at the height of McCarthyism in the 1950s meanwhile ultimately signalled the IPR’s death knell amongst its most influential national grouping. The IPR has since retreated to the historical margins, seldom appearing in historians’ footnotes, belying its direct and indirect influence in the making of contemporary Asia-Pacific studies. This short article has sought to redress this imbalance by sketching out just some of the ways in which Asia-Pacific studies owes the IPR an intellectual debt and why its legacy deserves a second glance. Not just by historians, but anyone who defines the Asia-Pacific as their field of study. Sean Phillips is a doctoral student at Nuffield College, University of Oxford. He is an Editor-at-Large at the Toynbee Prize Foundation Blog and a Convenor of the Oxford Sudbury Transnational & Global History Seminar. You can reach him at Sean.Phillips@nuff.ox.ac.uk or follow him on Twitter @SeanPhillips91. Image Credit: Wikimedia Commons.